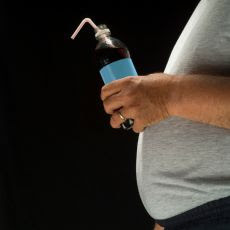 Have you seen this list of the Top 5 Most Unhealthy Drinks from Men's Health? It's shocking. 130 calories, 33 grams of sugar. Vitamins and water might seem like a good idea but what they don't advertise is that this water contains nearly as much calories and sugar as a can of soda. It should be no surprise that this stuff is made by The Coca-Cola Company. 360 calories, 84 grams of sugar. These bottles which are just 5 percent juice cost 99 cents which makes them one of the cheapest source of empty calories in the country. Whether you call it a smoothie or a milk shake, it has more sugar than a bag of chocolate chips. Because of the super sweet pineapple juice and fatty coconut milk, the only wise thing to consume here may be the garnish. Try a lime daiquiri or mojito instead and save 400 calories. 73 ingredients go into this milk shake. 8-12 minutes to consume this drink. 240 minutes on a treadmill running at a moderate pace to burn it off.